In 2017, TM Racing celebrated its 40th anniversary. Over the years, TM Motorcycles has had color schemes of red, orange, hot pink and, for the last 20 years, blue. The most memorable color was the bright pink motif. Some asked, “What were they thinking?”, while others thought it was the hottest thing on two wheels. There was no in-between—people loved it or hated it. Although everyone agreed the color stood out and brought attention to the TM brand, there was no consensus on whether it was a good or bad idea. One thing was sure—TM’s founding fathers, Claudio Flenghi (Mr. Engine) and Francesco Battistelli (Mr. Frame), didn’t care. They wanted to make TMs for the few, not the many. They wanted to be different, and they were. Finding a pink TM is harder than you may think. TM prides itself on its Italian craftsmanship, not speed and efficiency like the “Big Four” Japanese manufacturers. TM hand-makes less than 2000 units globally per year. KTM produces around 160,000 per year. Additionally, less than 200 TMs are imported to the United States a year—and, over the majority of the last 40 years, there have been no TMs crossing the ocean. 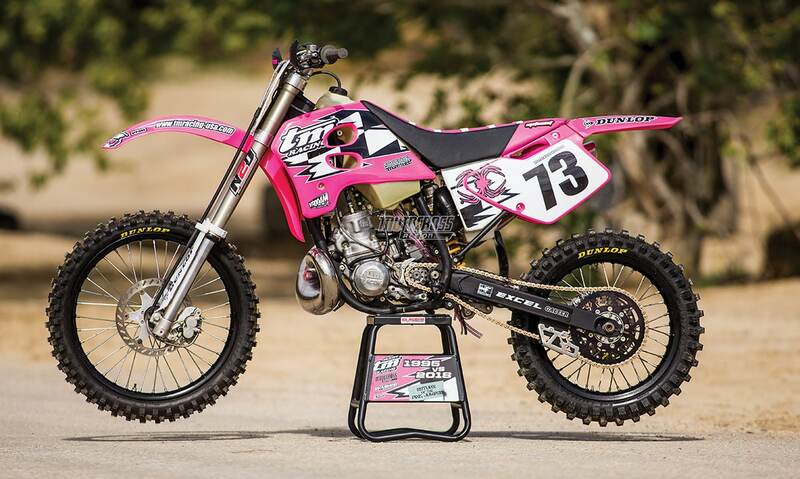 If you’ve never seen a true-to-life pink TM, don’t fret. They are rare. Two decades of development meant that the 2018 TM MX250 was faster, but the 1995 TM MX250 had charms of its own. You will be surprised. Don’t judge a book by its cover. 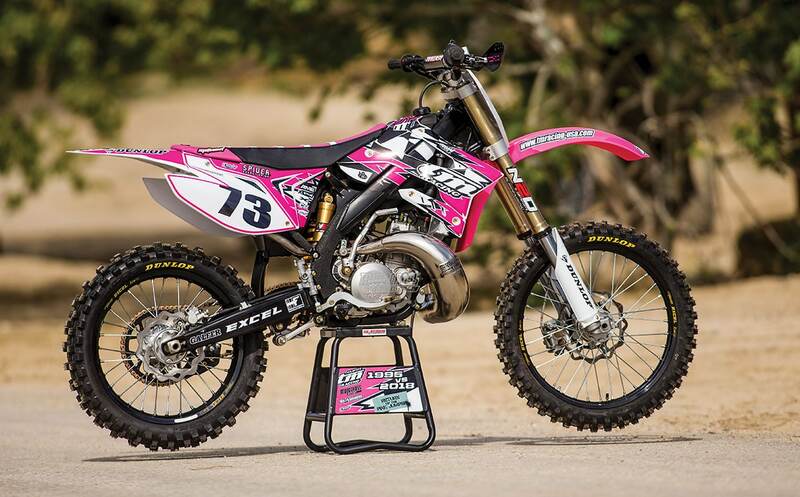 So, we were surprised when U.S. importer Ralf Schmidt brought us his pink 1995 TM MX250. 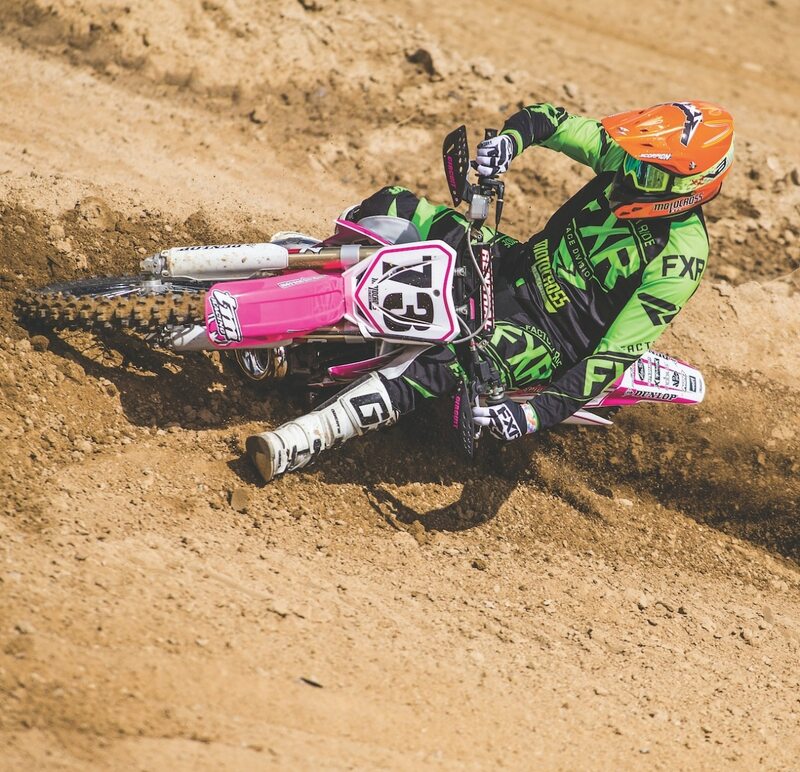 Ralf also gave us a 2018 TM MX250 that he had decked out in retro-pink plastic. Ralf wanted us to test the 1995 TM MX250 against the 2018 TM MX250. We didn’t get it. What was the point of comparing a 23-year-old bike against a new-age 2018 Italian stallion? We hemmed and hawed and told Ralf that we were really busy and weren’t sure when we could get to it, but Ralf was persistent. 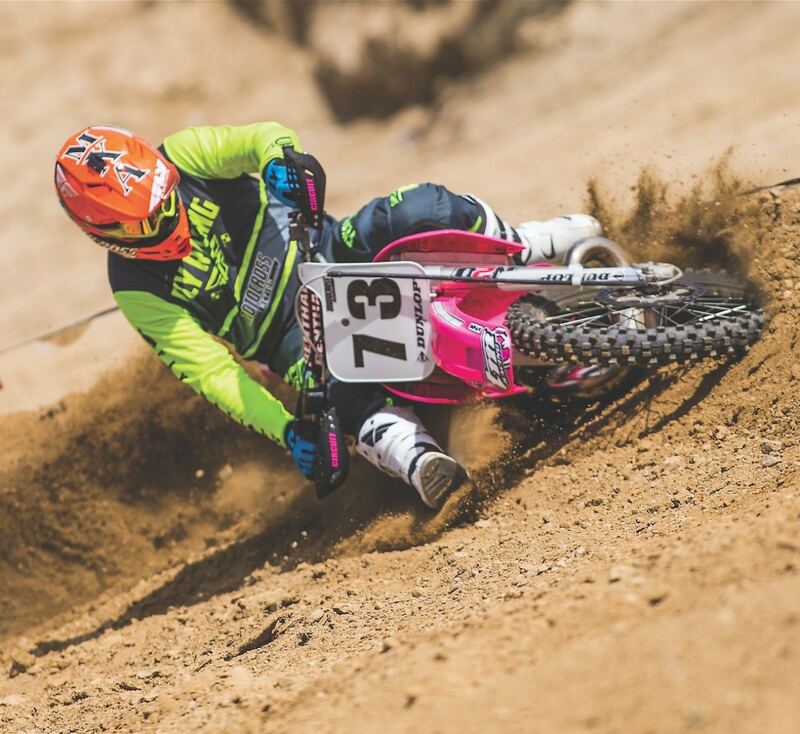 To be honest, no one from the MXA wrecking crew wanted to ride a 23-year-old vintage bike. It would be like going to Tom White’s Early Years of Motocross Museum and rolling one of his “Classic Iron” bikes out to race in the AMA 250 Nationals. Normally, MXA test riders jump at the chance to be the rider selected, but this time they were as quiet as church mice. We decided to play a game of Rochambeau (better known as rock, paper, scissors) to see who would have to ride the pink dinosaur. Out of the five test riders, two losers would get the gig. But, before we tell you what happened in the game of Rochambeau, we are going to let Ralf tell you a story about the significance of what he calls the “Pink Jumper,” then we will get back to how the test went. Take it away, Ralf. It wasn’t easy to get an aluminum-framed 2018 TM MX250 to look like a steel-framed 1995 TM, but the shocking pink went a long way to distracting the human eye. The MXA test riders didn’t want to ride the ancient MX250, but once they did, we couldn’t get them off it. “I loved that bike. The suspension was soft with oil dripping out of the forks, but the bike did nothing wrong. The Pink Jumper made a statement that day. When I returned a few weeks later with new tires, the competition wasn’t cracking jokes anymore. Two years in a row, I won my class at the TM des Nations event. The bike is still in Europe, and at next year’s TM des Nations, I will be there on the Pink Jumper to defend my title. After a round of rock, paper, scissors, it was MXA’s Daryl Ecklund and Dennis Stapleton who were assigned the test job that no one wanted. That was when Ralf told them that he wasn’t sure that the 1995 model would even start, which was just fine with them. But, after three kicks, it fired up. Dennis and Daryl looked at each other knowing one of them would have to ride it first—and neither one wanted to be the guinea pig. 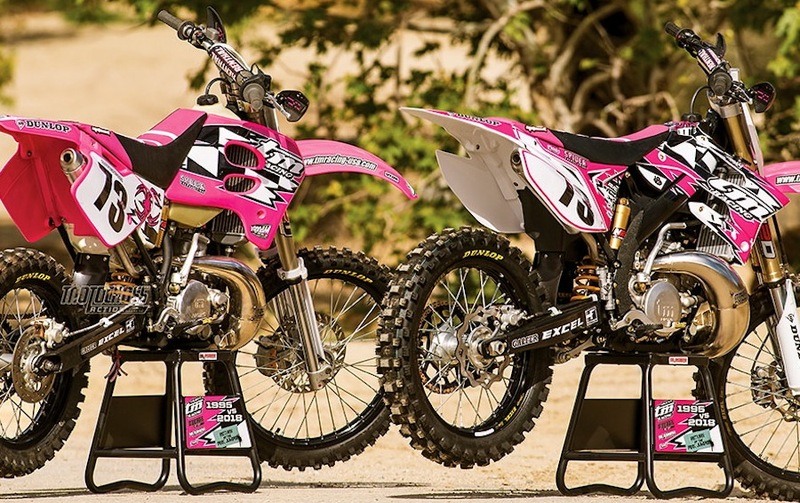 They played another game of Rochambeau, with the loser getting the pink 1995 TM and the winner getting the remodeled pink 2018 model. Dennis’ scissors beat Daryl’s paper, but it didn’t really matter, since they had to switch back and forth for the duration of the test. They switched bikes and, as a courtesy, Daryl, now on the 2018 TM MX250, gave Dennis a few bike lengths’ lead going into Talladega. When Daryl caught up to the back fender of the 1995 TM MX250, the war began. Dennis pulled a few bike lengths on Daryl through the rough parts of the track, and Daryl gapped Dennis on the big hills. Pretty soon, the racing changed from friendly test riding to a very intense game of winner-take-all. Swerving, blocking and tricky moves were employed in every corner. The bike they had been afraid to ride, they were now hucking over big jumps. Both Daryl and Dennis said the 1995 bike was underpowered, but because it had a low center of gravity and plush suspension, they could hit bumps harder and go through corners faster. They didn’t want to stop riding. They would come back into the pits, get more gas, switch bikes and go back out. 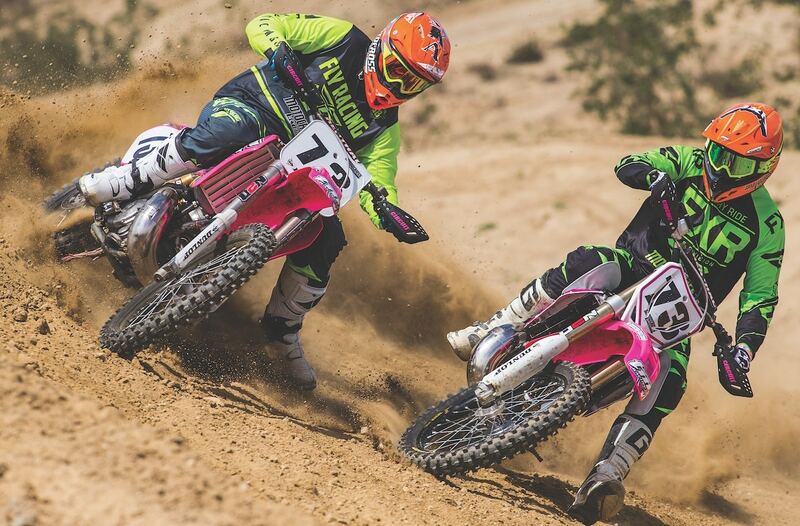 When asked if they could race a 23-year-old bike, they both said, “Yeah,” in unison. The professional opinion was that the 1995 TM MX250 was every bit as much fun to ride as the $7000-more-expensive 2018 model. Maybe Ralf was on to something. Do you really need the latest and greatest machinery to have fun? Nope, nada, nyet, nein—not when passing guys on your 23-year-old bike feels just like winning a Grand Prix.